If you see yourself as a bit of history and culture buff with an eye on traveling beautiful European cities, then there are many few places better to visit than Florence in Italy. Year after year, millions of tourists flock to the city in order to adventure through it’s fascinating interwoven streets of historical past. Florence has been called “Athens of the middle ages,” with a powerful political, artistic, and economic history that often labels it as the birthplace of the European Renaissance. It’s a city of great stature and a place holding centuries worth of religious and cultural significance bottled up deep within the walls of its museums, art galleries, and ancient buildings. It’s a remarkable place to explore and learn from. If you fancy checking all of this out, then have a look below at some of the best things to do and best places to visit. One of the oldest and most famous art galleries in the western world. It holds some of the world-renowned renaissance masterpieces of the art world – truly one of a kind paintings, including some created by Michelangelo and Leonardo Da Vinci. A mouth-drooling market at the center of Florence. You’ll be able to see, taste, and smell some of the finest traditions of Florentine food. It gives you a mouth-watering feel of the best Florence has to offer in terms of people, culture, and food. Plus, there is now a floor of the market which hosts established restaurants, bars, and cafes. A very, very tall Cathedral. Four hundred sixty-three steps later, you can reach the top of the impressive cathedral to stand tall above the rest of Florence below. As a place for you to look out open, it allows you to grasp the geographical landscape of the city. You could stand up there for hours looking at the view. It is one of the most photographed locations in the city – built by Vasari in 1565 linking Palazoo Vecchio to Pitti Palace. It’s the perfect opportunity for a great vacation selfie. A small district often described as a unique little town in itself. The Oltrarno is an area where you will find a lot of unique heritage – including quaint museums to explore, churches to gaze at, stunning palaces to wander around, and parks to relax in. It’s an intimate place for you to learn about the societal workings of the city. Probably the most famous public square in Florence. 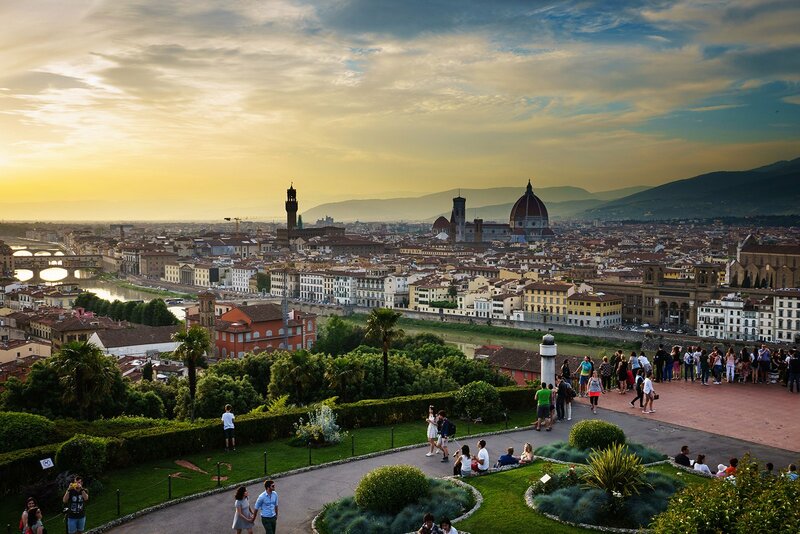 The Piazzale Michelangelo has a spectacular panoramic view of the city, acting as an observation point to view the city’s skyline of beautiful historic buildings. A great place to sit and people watch with a delicious Italian coffee. If you have a trip booked to Florence, make sure you check these places out. Florence is a fascinating city. An enchanting place for you to learn. A beautiful city for you to marvel at.